The original uncut Radio Broadcast. On the evening of October 30th, 1938, Earth went to war with Mars. Martians invaded New Jersey! Here, the famous panic broadcast that shook the world, starring Orson Welles. This is the legendary radio broadcast of Halloween 1938. Orson Welles's dramatisation of The War Of The Worlds is extremely well staged. Written and performed in the style of emergency radio transmissions of the time - complete at first with musical interludes - they do a very good job of persuading you of the horrific monstrosity of the invading martians and the - in some cases - absolutely vile actions they commit. The dramatisation may be dated now especially since it was recorded on equipment we would now consider practically ancient and as such the audio quality and in some cases the personal attitudes of the characters in the play would be considered extremely old fashioned depending on your point of view but I still highly recommend people listen to this version. It became famous for a reason after all! Another aspect of the drama I wish to praise is the relocation of the main focus of the invasion. Clearly in an attempt to modernise the original story to 1930s eyes and ears and his American audience Welles and his team successfully managed to relocate the play to a small rural area in New Jersey. Long story short: It's a piece of sci-fi history that's less than hour long. It deserves its place in the pantheon alongside the original novel and the surprisingly good Jeff Wayne version. It's more than worth your time and money. Give it a listen. I was born in the earlier times before TV took off, listened to the Lone Ranger and The Shadow on the radio so I greatly appreciate the beauty of Audible books to transport my mind to another place. Orson Welles classic retelling of the War of the Worlds seems preposterous today but then there were no verifiable communication like we have today. People believed that Martians came to this world and destroyed New Jersey and New York. The radio players couldn't believe their broadcast created hysteria. It sounded real, like they were switching between a dance party, an observatory, an investigative journalist, etc. In today's terms, how could people be so gullible?! But back then, how could they believe anything but?! Still Creepy after all these Years! 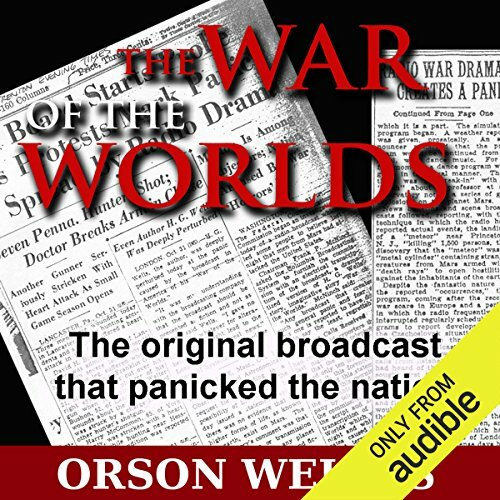 What made the experience of listening to War of the Worlds (Dramatized) the most enjoyable? Since this is a radio broadcast it is meant to be listened to. Even though the sound effects are cheesy at best, and the recording is old, it still manages to creep you out. I can understand how there were reports of people panicking when they came into it without hearing the intro. Orson Welles had an extremely distinctive voice, it was made for this venue. The story keeps very close to the original story. BTW, don't rely on the movie version of this story for the truth. Buy the HG Wells original story (Its free on Kindle). The story takes place at the turn of the 19th and 20th century in England but it is really good. Which character – as performed by Orson Welles – was your favorite? Professor Pierson who narrarates the story is compelling and the varying emotions in his voice, from skeptisim (sp) to outright horror, makes it more realistic. Neither, it scared the hell out of me. I have a 90 minute commute to work and I listened to it at night during a rather bad storm. Add to the fact that hwy 67 has no streetlights and well, you get the picture. My only complaint is that its a bad copy with a part of part 2 coming in during part 1 with a rather annoying screech to it. You need to get a better copy. I listen to it at least once a week lying in bed just before i go to sleep and it never gets old. Based off a book, Orson Wells made a great science fiction novel become reality for the nation. something that as far as i know has yet to produce as much a nation wide reaction. I listened to this with friends to celebrate the holiday, and was a little surprised to find myself on the edge of my seat, waiting with baited breath to see what would come next even though I have read the book and seen at least one movie adaptation. I would love to see more radio shows like this produced today. They're as good as a movie and cheaper to make. Boy............. to listen instead of watching is the best ever! Your imagination is more powerful than the eyes. Worth 1 hr of your life! This original production was so pivotal when it originally aired that it remains a part of our modern culture to this day. How did one radio show convince 1 million people across the nation that the world actually ending? Terrifying the mass population into a widespread panic that broke out across the country. Phonelines went down because of the volume of emergency calls. The streets of NJ were ar a stand still with people trying to flee to city. Orson Welles had to make an impromptu announcement during the original broadcast to remind the listeners that it was only a show! This was written and performed over the radio on Halloween Eve in 1938. This got Orson Welles career kick started. That alone makes it important. This adaptation of The War of the Worlds is brilliant. There is controversy over the panic that this caused or didn't cause. It seems up till than the show was not popular. All my reviews are aimed at the modern listener. Something may have been great in the past, but not so in the present. This story and this production has stood the test of time. No, you will not be scared, but anyone with an imagination can see how it could have been very scary. This was a great way to update H.G. Wells story, just as the several movies that have been made since then. Probably every generation will get to see their own adaption of this great story. It's less than a buck, and less than an hour of your time. If you like the sample provided, you will like the whole thing. I was thoroughly impressed. The radio broadcast sounded so convincing I could see why it caused panic on the New Jersey roads. Orson Welles genius really shined through. Very creative and original. I wish more people did things like this today. Historical classic. I listened to this on a dark drive to my parents' late at night and it was truly entertaining. Some points were difficult to hear in the old time radio style, but it gave me chills and thrills on an otherwise boring, noneventful drive. I would recommend listening to this at night with minimal lighting.